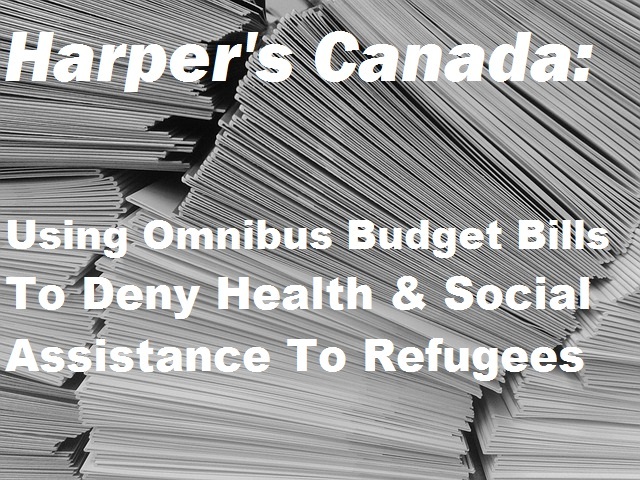 The Conservative government of Canada (sometimes called the Harper government) is up to its old tricks, hiding important policy changes in giant omnibus budget bills in the hopes that no one will notice. As outlined here, this time the hidden policy is yet another attempt to make life for refugees in Canada as difficult as possible. Buried deep in Bill C-43 is a provision designed to encourage the provinces to cut off social assistance for vulnerable newcomers to Canada, many of whom have been traumatized by violence, war and oppression, many of whom are just trying to start a new life, often having arrived in Canada with little beyond the clothes on their backs. I’m going to make this post short, so as to keep my anger in check, but whether you’re welcoming to refugees or not, at least ask yourself this: can you trust a government that hides half of what it wants to do in giant budget bills precisely because they want as few people as possible aware of their plans? The Conservatives do this all the time, one of the worst examples being Bill C-38 from two years ago. If the Conservatives truly believe that their plans represent good government policy that the majority of Canadians would support, why can’t they be open and honest about their intentions? I have just completed my PhD in Communication and Culture with a research focus in media, religion and culture. This entry was posted in Canada, Immigration and Refugees, Politics and tagged Government, News, Refugees, Trauma. Bookmark the permalink.